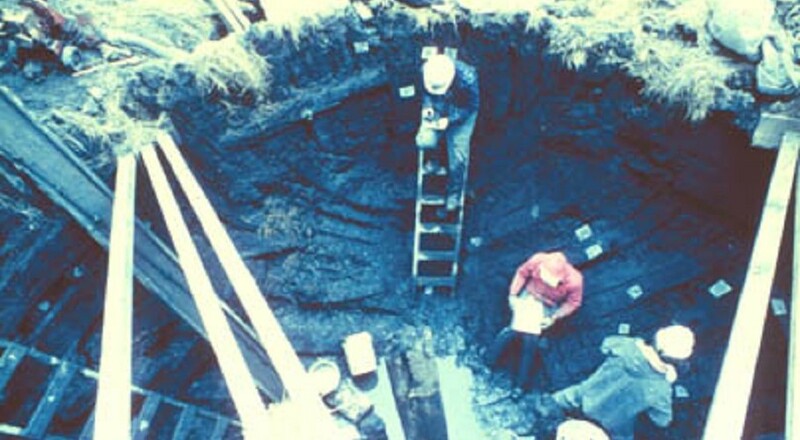 During an archaeological investigation of a construction site in January, 1982 at 175 Water Street in lower Manhattan, the hull of a merchant ship was discovered in colonial era landfill. The developer of the site, Howard Ronson, for whom the wreck has also been named, made possible a recording of the hull by personnel from INA, the Nautical Archaeology Program at Texas A&M University, New York-based archaeologists, and a number of volunteers. The hull dated to the 18th century, the first such find of a merchant ship from that period. It was a three-masted ocean trader about 30.5 m long, 8 m in beam, at least 200 tons burden. The ship was constructed oak with a sheathing layer of softwood overlaying a mastic of animal hair and pitch. The Ronson Ship was an old hull, a condemned vessel that was positioned on the bank of the East River and filled with rubble to act as a crib for a wharf or an expansion of the waterfront. Its excavation revealed that the ship had been stripped of its rigging, gear, and decorations, before being filled with debris. The ship was a British merchant frigate, built to sail in shallow as well as deep water, and probably constructed in Virginia or the Carolinas between 1710 and 1720. She possibly served as a tobacco carrier between the Chesapeake colonies and Britain. Artifacts in the hull suggest she was buried in Manhattan in mid-century. 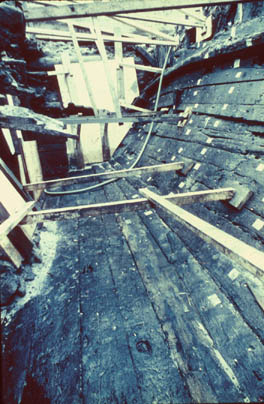 As the entire hull was too expensive to remove, conserve, and display, the bow of the ship was saved for conservation. After excavation, the bow of the Ronson Ship was removed. Its reconstruction revealed a typical 18th-century bow assemblage, as it is described in the documents of that time, but showed many practical aspects of construction which are never described in written sources. It is now housed in the Mariner’s Museum in Newport News, Virginia. The project was led by co-directors Warren C. Riess and Sheli O. Smith. Read The Ship That Held Up Wall Street by Warren C. Riess with Sheli O. Smith to learn more about this project. The book can be purchased here: Texas A&M University Press. Warren Riess and Sheli O. Smith, “The Ronson Ship,” Sea History(Summer 1983): 20-22. Warren Riess, “The Ronson Ship: The Study of an Eighteenth Century Merchantman Excavated in Manhattan, New York in 1982,” Dissertation, University of New Hampshire, 1987. Jay Rosloff, “The Water Street Ship: Preliminary Analysis of an Eighteenth-Century Merchant Ship’s Bow.” Master’s Thesis, Nautical Archaeology Program, Texas A&M University, 1986. J. Richard Steffy, “The Thirteen Colonies: English Settlers and Seafarers,” in Ships and Shipwrecks of the Americas, ed. G. F. Bass (Thames and Hudson, 1988), pp. 107-128. J. Richard Steffy, “The Ronson Ship,” in Wooden Ship Building and the Interpretation of Shipwrecks (Texas A&M University Press, 1994), pp. 168-70. 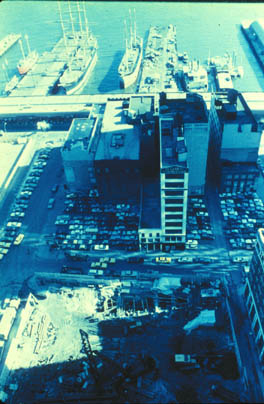 ABOVE: (Left) The site on Water Street with the ships of the South Street Seaport Museum in background. (Right) Inside the hull.